POSH REVIEW: Who made the most appearances, scored the most goals, picked up the most bookings? Jon Taylor made the most Posh appearances in the 2015-16 season. Photo: Joe Dent/theposh.com. Michael Bostwick picked up the most cautions by a Posh player in the 2015-16 season. Photo: Joe Dent/theposh.com. The home match with West Brom in the FA Cup has been registered as a draw. Posh lost the tie on penalties. With 82 goals, Posh were the joint­highest scorers in League One alongside champions Wigan. The 155 goals in 46 League One matches involving Posh was the second highest total after games involving Colchester (156). 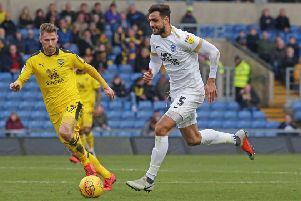 Ten home league defeats is the joint third highest number in Posh’s 56-­year Football League history, beaten only in 2004-­05 (12) and 2009-­10 (12). Ten away league wins is the joint third highest number in Posh’s 56­-year Football League history, beaten only in 2007­-08 (14), 2008-­09 (12). 51 Jon Taylor, 47 Ben Alnwick, 46 Marcus Maddison, 43 Michael Bostwick, Ricardo Santos, Michael Smith, 41 Chris Forrester, 38 Lee Angol, 35 Erhun Oztumer, 32 Souleymane Coulibaly, 31 Conor Washington, 27 Gaby Zakuani, 26 Harry Beautyman, 22 Jack Baldwin, Andrew Fox, 21 Callum Elder, Shaquile Coulthirst, 20 Martin Samuelsen, 18 Jermaine Anderson, 12 Jack Collison, 10 Alex Davey, Aaron Williams, 8 Kgosi Ntlhe, Leo Da Silva Lopes, 7 Harry Anderson,Tom Nichols, Harry Toffolo, Kyle Vassell, 6 Joe Gormley, Adil Nabi, 5 Tobi Adebayo-Rowling, Simon Gillett, Callum Chettle, 4 Stuart Moore, Lawrie Wilson, 3 Miles Addison, Shaun Brisley, Mark Tyler 2 Jordan Nicholson, Jack Payne, 1 Dion­-Curtis Henry, Kieran Sadlier. Posh used 42 players in the 2015/16 season, 41 of them in League One, the most in the division . Kieran Sadlier made his one appearance in the Capital One Cup. Jon Taylor is the top Posh appearance maker in 2014-15. He made just 25 appearances in 2013-14. 15 Conor Washington, 13 Jon Taylor, Marcus Maddison, 11 Lee Angol, 6 Jermaine Anderson, Erhun Oztumer, 5 Souleymane Coulibaly, 4 Michael Bostwick, 3 Harry Beautyman, Gaby Zakuani, Shaquile Coulthirst, 2 Chris Forrester, Martin Samuelsen, Aaron Williams, 1 Miles Addison, Jack Baldwin, Callum Elder, Andrew Fox, Tom Nichols, Ricardo Santos, Michael Smith. Conor Washington left in January. Lee Angol, Marcus Maddison and Jon Taylor scored the most League One goals (11). Marcus Maddison’s tally of 13 League One assists was the joint­ highest alongside Tony McMahon of Bradford City. Taylor had the second highest number of Posh assists (5). 2 Ricardo Santos, 1 Jermaine Anderson, Jack Baldwin, Chris Forrester, Erhun Oztumer, Michael Smith, Gaby Zakuani. 14 Michael Bostwick, 11 Ricardo Santos, 9 Jack Baldwin, Michael Smith, 8 Chris Forrester, 7 Andrew Fox, 6 Lee Angol, 5 Ben Alnwick, Jermaine Anderson, Marcus Maddison, 4 Harry Beautyman, Shaquile Coulthirst, Gaby Zakuani, 3 Souleymane Coulibaly, Leo Da Silva Lopes, Callum Elder, Kyle Vassell, 2 Miles Addison, Simon Gillett, Kgosi Ntlhe, Martin Samuelsen, Jon Taylor, Harry Toffolo, Conor Washington, 1 Harry Anderson, Shaun Brisley, Jack Collison, Alex Davey, Joe Gormley, Erhun Oztumer, Kieran Sadlier. Ricardo Santos was one of three players to be sent off twice in League One this season. Ian Black (Shrewsbury) and Ian Henderson (Rochdale) were the others. Posh picked up more yellow cards (114) in League One matches than any other team. Only Chesterfield (8) picked up more red cards in League One matches. More statistics will appear online tomorrow (May 15).